Set up user permissions at the backup repository side. Point the Veeam Agent backup job to the backup repository. 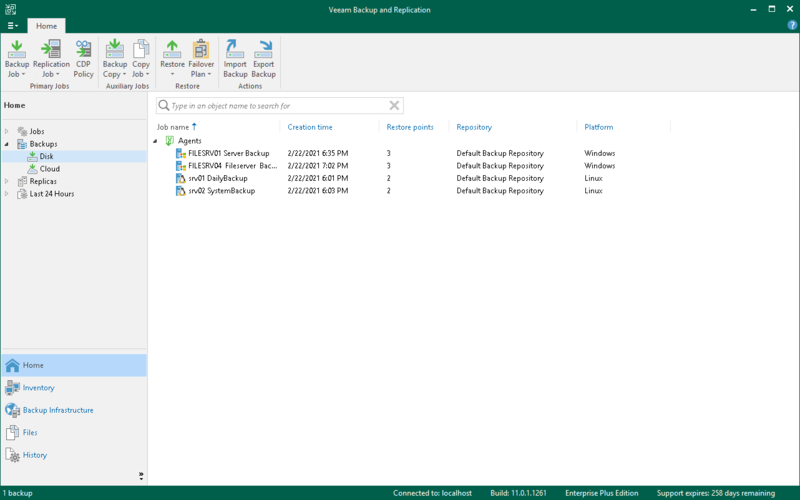 A Veeam Agent backup job can be started automatically upon the defined schedule or manually from the Veeam Agent computer. You cannot start, stop, retry or edit Veeam Agent backup jobs in the Veeam Backup & Replication console. The user who creates a Veeam Agent backup on the backup repository is set as the owner of the backup file. Only the backup file owner can access this file and restore data from it. Other users cannot see backups created by the backup file owner. If the user is granted restore permissions on the Veeam backup server, the user will be able to see all backups on the backup repository. Backup jobs targeted at the backup repository become visible in Veeam Backup & Replication under the Jobs > Backup node in the Home view. Backups created with Veeam Agent for Microsoft Windows are available under the Backups > Disk node in the Home view. The backup administrator working with Veeam Backup & Replication can manage Veeam Agent backup jobs and restore data from Veeam Agent backups. To learn more, see Performing Restore Tasks and Performing Administration Tasks.